Though firearms have been in widespread use for more than half a millennium, the science of identification is a relatively new practice. With the popularity of television shows and films that have brought exposure to the many disciplines and specialties within forensics, firearms examination has become a popular career aspiration, leading many to wonder just how to become a forensic firearms and ballistics expert. Firearms examination is a highly specialized field of forensic science. These well-trained examiners can help detectives and criminal investigators get important information about how gun crimes were committed and help identify the weapon used. They can determine the trajectory of a bullet, the distance a shooter was from the target, whether or not a discharge was accidental, the position a shooter was in when he fired a weapon, and (perhaps most importantly) pinpointing the exact weapon used in a crime by comparing a fired bullet to the barrel of a specific gun. Forensic science careers are becoming an increasingly popular choice among people looking for jobs in criminal justice and criminology, and have even begun to draw the interest of those who may not otherwise have been inclined to work in the field. This has led to greater competition for jobs. Fortunately, the importance of proper evidence analysis and sound forensic tactics is increasingly being realized by law enforcement agencies. Unfortunately, there are still a lot of people vying for not a lot of jobs, which means it will take hard work, preparation and dedication to earn a job in the field. Demonstrable competency in the field of firearms examination, to be determined by the hiring agency. This can be shown through an evaluation of prior casework or through a testing and evaluation process. Experience can be substituted for the educational requirement if the candidate can show sufficient expertise in the field. These are merely the minimum requirements expected of an aspiring firearms examiner. simply meeting these will not at all guarantee a job in the field. In order to increase your chances of getting hired, you'll want to gain experience and education that will make you an expert in firearms examination even before you take your first "real" job. Since the bulk of the science of firearms and ballistics examination is found in physics, this is the scientific discipline that will best prepare you for your new career. Understanding what forces are at work, and how they work, in the firing of a weapon is key to becoming an expert examiner. High academic performance in this area will give you the scientific foundation you'll need and the competitive edge you want. What Makes You Competitive for Firearms and Ballistics Specialist Jobs? A strong scientific background is just one piece of the puzzle. You also need to be familiar with aspects of crime, the criminal justice system and processes, and especially evidence collection and preservation procedures. You can gain a foundation in these areas by taking elective courses in criminology, criminal justice, and forensics. The truly competitive candidate will enter her first job with a wealth of experience already under her belt. To get the experience you'll need to put yourself ahead of the rest, look for internships and volunteer opportunities with forensic labs or law enforcement agencies. Hone your knowledge and expertise by reading periodicals and journals produced by associations such as SWGGUN, The Association of Firearm and Tool Mark Examiners and the International Association for Identification. This will help you stay up-to-date on the trend affecting the industry, help you learn more about the field and even find jobs. Knowledge is one part of the equation, but without the ability to articulate your findings, that knowledge won't help anyone. Any good examiner must have excellent analytical skills. They must also be very adept at both oral and written communication skills. This will not only help you in your job interview, but in explaining your findings to investigators and during courtroom testimony situations. The SWGGUN recommends examiners undergo a thorough background investigation, and rightly so given the sensitive information and environments you'll be working in. Because of this, it's vital that if you even have an inkling that you may be interested in working as a ballistics expert (or any other criminal justice or criminology career for that matter) you should avoid behaviors that could keep you from getting hired. This includes criminal acts, such as DUI's and other serious misdemeanors or felonies, as well as drug use and other questionable activities. Forensic firearms and ballistics experts receive training (both practical and in the classroom) in areas including various types of weapons and ammunition, gunshot residue detection, distance determination, bullet comparison, firearms examination and evidence handling procedures. The bulk of this training can be gained during the "trainee" phase, but you can get a head start by visiting the Firearm Examiner Training website, maintained by the Research Development and Evaluation Agency of the U.S. Department of Justice. There may be few fields as fascinating and challenging as firearms examination. To find work in the field, you need to have a strong eye for detail and a great understanding of how the laws of physics affect projectiles and their targets. 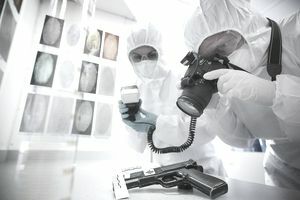 With a firm grasp of physical science, knowledge of the criminal justice system, investigative techniques and the importance and intricacies associated with evidence handling, you can be well on your way to enjoying an interesting and exciting career as a forensics expert in firearms and ballistics. In fact, you may just find that it's the perfect criminology career for you.